Bishop of Lourdes to pay a historic visit to Jordan. Bishop of Lourdes Monsignor Nicolas Brouwet is scheduled to pay a historic visit to Jordan on September 17-22, 2018. During the visit, he is scheduled to meet with the French ambassador to Jordan, Latin Patriarchal Vicar for Jordan Bishop William Shomali and Latin Patriarchate of Jerusalem priests in their monthly retreat as well as with religious men and women in Naour Church. Monsignor Brouwet is also expected to meet with senior Jordanian officials, and is scheduled to meet with Most Rev. Archbishop Pierbattista Pizzaballa, Apostolic Administrator of the Latin Patriarchate of Jerusalem, visit sick people in their homes, and tour Christian sites including the Baptism Site, Mount Nebo, and Madaba churches. The highlight of his visit is celebrating Mass at Our Lady of Lourdes Grotto in Naour on Friday, September 21 at 5:00pm. 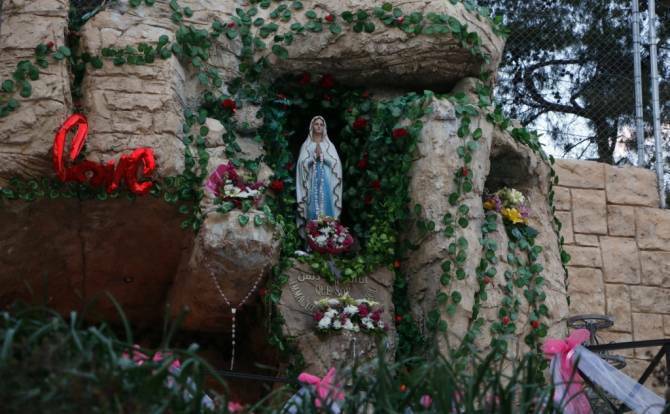 The Catholic Church in Jordan celebrated on Saturday, May 2, 2015 the launching of the first grotto dedicated to Virgin Mary that bears the name of Our Lady of Lourdes at the Latin Church in the Naour township, south of Amman. This grotto has been added to several shrines and pilgrimage sites in Jordan. In July 2017, Fr. André Carp, president of the Family of Our Lady of Lourdes, presented a certificate signed by Bishop Brouwet stipulating that Our Lady of Lourdes grotto in Naour had already acquired the global membership of the Family of Our Lady of Lourdes. This is a resounding achievement that gives credit to the sublime role played by the Catholic Center for Studies and Media in Jordan on the one hand and underlines the infinite love and appriation to Blessed Virgin Mary, the Mother of the Church on the other. A resounding Mass, with a candle-lit procession in the company of the Fountain of Love Choir, will be celebrated at Our Lady of Lourdes Grotto in Naour marking the historic visit of Bishop of Tarbes and Lourdes Monsignor Nicolas Brouwet to Jordan on Friday September 21, 2018 at 5:00pm. With Masses celebrated over the past years at Our lady of Lourdes grotto in Naour to mark various religious feasts, the historic visit of Bishop of Lourdes Monsignor Nicolas Brouwet to Our Lady of Lourdes grotto in Naour will be momentous as it will furthermore highlight the significance of the grotto on the one hand and promote religious tourism to Jordan on the other. The Catholic Center for Studies and Media in Jordan and the members of staff welcome Monsignor Nicolas Brouwet and wish him a happy stay in Jordan.